Association of periodic paralysis and thyrotoxicosis had been documented by Rosenfeld as early as 1902. Thyrotoxic periodic paralysis (TPP) is more commonly reported in Oriental Asians. , It has also been reported from the western countries as a result of migration of different ethnic populations. , TPP is a serious complication of hyperthyroidism, which is characterized by muscle paralysis and hypokalemia due to a massive intracellular shift of potassium. The thyrotoxic patients have an underlying tendency for muscle Na/K-ATPase overactivity, which is aggravated by insulin, catecholamines or exercise. The overactivity of Na/K-ATPase drives serum potassium into the intracellular compartment causing hyperpolarization, apparent hypokalemia and muscle weakness. There are isolated case reports on TPP from India, but there is no comprehensive study about their clinical, laboratory parameters and outcome. ,,, TPP should be differentiated from idiopathic hypokalemic periodic paralysis (IHPP), as these require specific treatment. We report the clinical and laboratory findings in nine patients with TPP who were managed by us in the last 11 years and compare their clinical and laboratory findings with IHPP. The records of patients with hypokalemic periodic paralysis (HPP) managed by us during Jan 2001 to 30 June 2011 were extracted from the computerized hospital information system. The patients' demographic and clinical data, including age, gender, family history of similar illness and thyroid disorders, drug intake, duration of illness, number of attacks, duration of each attack and precipitating factors (exercise, diet, alcohol, infections and stress), were noted. During the hospitalization, the severity of weakness, presence of respiratory failure, need of mechanical ventilation and time of recovery following treatment were also recorded. Severity of weakness was divided into mild (grade 4), moderate (grade 2-3) and severe (grade 0-1), based on maximum muscle power in the limbs. The laboratory data such as blood counts, ESR, hemoglobin, blood sugar, serum creatinine, bilirubin, SGPT, albumin, sodium, potassium, calcium and magnesium were also noted. The etiology of HPP was defined by arterial blood gas, blood pH, serum electrolyte, anion gap, thyroid function test and urinary pH and electrolytes. Thyrotoxicosis was defined as TSH (thyroid stimulating hormone) <0.3 mIU/L and free T4 >25.7 pmol/L or T3 >2.8 nmol/L and T4 >160 nmol/L; and subclinical hyperthyroidism as TSH <0.3 mIU/L and normal free T4 or normal T3 and T4 after excluding sick euthyroid syndrome or any drug effect. The clinical and biochemical parameters of the patients with idiopathic periodic paralysis and TTP were compared by Chi square test, Fisher exact test, independent t test and Mann-Whitney U test by using the Version 15 software. The variables having a two-tailed P-value of <0.05 were considered significant. During the study period, there were 52 patients with HPP, which comprised of TPP in nine (17.3%), renal tubular acidosis-I in seven (13.5%), Gitelman syndrome in five (9.6%), Conn's syndrome in three (5.8%), renal tubular acidosis-II in one (1.9%) and IHPP in 27 (52%) [Figure 1]. The mean age of the patients with TPP was 33.6 (22-48) years, and only one was a female. The mean duration of illness was 9.6 months (1 day to 60 months) since first attack of periodic paralysis. Four patients had one attack, one had two attacks and four had three or more attacks of paralysis. Most of the patients were admitted during the spring (two patients) or summer (four patients) months and none during the winter months. The precipitating factors for muscle weakness were high-carbohydrate meal in two and preceding febrile illness in one patient. None had physical stress or alcohol as a precipitating factor. Five patients had tachycardia on admission and the pulse rate ranged between 110 and 126/min. One patient had hypertension. The severity of weakness was variable, and ranged from mild to severe weakness. On admission, severe weakness (grade 0-1) was present in four, moderate (grade 2-3) in two and mild (grade 4) in three patients. Bulbar weakness was present in two patients, which was evidenced by nasal regurgitation, nasal intonation, swallowing difficulty, weak gag reflex and normal pharyngeal sensation. Both the patients also had respiratory distress, but did not require mechanical ventilation. None of the patients had facial or ocular involvement. Kidney and liver function tests were normal in all. Mean serum potassium level was 2.21 (1.44-3.4) mEq/L; two patients had serum potassium level below 2 mEq/L. Serum phosphorous was reduced in seven and serum magnesium was normal in all. Serum TSH was low in all, ranging from <0.01 to 0.15 mIU/L. Only one patient was already diagnosed case of hyperthyroidism prior to the occurrence of TPP. Five patients had symptoms of thyrotoxicosis on admission. Toxic nodular goiter was present in one, Grave's disease in two, diffuse toxic goiter in two, colloid goiter in one and thyroiditis in one patient. Subclinical thyrotoxicosis was present in four patients. The etiology of hyperthyroidism could not be determined in two patients. Subclinical hyperthyroidism was present in two patients. The patients were treated with potassium supplementation; five patients were treated with oral and four with intravenous potassium. The patients recovered within a mean duration of 34 (18-48) h. Rebound hyperkalemia (>5.5 meq/L) occurred in three patients during treatment; one also had >6.5 meq/L. None had cardiac arrhythmia or worsening of muscular weakness due to hyperkalemia. The referral diagnosis of the patients with TPP was Guillain-Barre syndrome in three, HPP in four and hysterical weakness in one patient. One patient received acetazolamide for prophylaxis on the advice of the primary physician. Demographic, clinical and salient laboratory features are summarized in [Table 1]. The demographic and clinical variables such as precipitating factors, presence of myalgia, number of attacks and severity of weakness were not statistically different between the two groups. None of the patients with IHPP had tachycardia. Respiratory involvement was present in six and bulbar weakness in four patients with idiopathic hypokalemic paralysis; two of these patients required artificial ventilation. Serum potassium level was significantly lower in TPP (2.21 ± 0.49 mEq/L) compared with IHPP (2.67 ± 0.59 mEq/L, P = 0.04). During treatment, eight patients developed rebound hyperkalemia; one had serum potassium level >6.5 mEq/L and four had in between 6 and 6.5 mEq/L. The frequency of hyperkalemia between IHPP and TPP was similar (P = 0.70). The recovery was faster in the IHPP (26.72 ± 15.35 h) compared with the TPP group (34.0 ± 14.03 h), although this difference is not statistically significant (P = 0.30). One patient in the IHPP group died because of respiratory failure with complications of mechanical ventilation, but no deaths were reported in the TPP group. The comparison of demographic and clinical parameters in TPP and IHPP is presented in [Table 2]. In our study, nine of 52 (17.3%) patients with HPP had TPP, and two-thirds of them had subclinical thyrotoxicosis/hyperthyroidism. The demographic and clinical variables as well as rebound hyperkalemia were not statistically different between the TPP and the IHPP groups. TPP is thought to be common in Oriental Asian males. It has been reported mainly from China, Japan, Korea, Taiwan and Singapore. ,,, The incidence of TPP in these regions ranges between 8% and 13% in males and 0.2% and 0.4% in females. Thyrotoxicosis however is common in females, but TPP in more common in males. The male to female ratio varies from 17:1 to 20:1 in Japan, 33:1 to 48:1 in the USA and 44:1 to 76:1 in China. ,, This figure is 8:1 in our study. A lower male to female ratio in our study may be because of the small sample size or difference in ethnicity. The commonness of TPP in males may be due to the influence of androgen in potassium homeostasis. Association of TPP in two patients with adrenal adenoma having hyperandrogenemia has been reported. It was postulated that androgen may have triggered TPP by inducing sodium potassium ATPase activity. TPP has also been reported from western countries, especially in American Indians and Hispanics. , These reports are attributed to migration of the oriental population. From India, the present report is the largest series on TPP. TPP commonly occurs in the age group of 20-40 years; the mean age of our patients is also 33.6 (24-48) years. , Patients with TPP have variable weakness, which may be precipitated by high carbohydrate meal, physical exertion, preceding febrile illness and, often, on getting up from the sleep, similar to patients with IHPP. In the present study, heavy carbohydrate meal and febrile illness were the precipitating factors in the TPP group, while heavy exercise and alcohol were the precipitating factors in the IHPP group. Seasonal variation of TPP attacks has been reported from China and in few other studies. , It has been attributed to increased consumption of sweet drinks, outdoor activities, exercise and increased potassium loss in sweat during the summer months. In our study, most of the patients with TPP were also admitted during the spring and summer months. Bulbar weakness in TPP has not been reported, although acute bulbar paralysis in the patients with thyrotoxicosis has reported in some patients who improved over weeks following treatment of thyrotoxicosis but not following potassium infusion. , Both our patients with bulbar weakness however improved completely after potassium infusion along with the improvement in limb power, suggesting a relationship of bulbar weakness and hypokalemia. Acute respiratory failure in a 29-year-old male with TPP has been reported, whose plasma potassium was 3 mmol/L. He improved following potassium infusion and was weaned from the ventilator after 14 h.  Bulbar weakness and respiratory paralysis have also been reported in a patient with severe HPP due to renal tubular acidosis. His neurological conditions improved following correction of potassium. Two of our patients with TPP had respiratory compromise, but did not require artificial ventilation. The serum potassium level in our TPP group was lower than in the IHPP group. In TPP, there is a shift of potassium ion into the cells rather than loss of potassium. This may result in very low serum potassium and may produce life-threatening paralysis and cardiac arrhythmias. Serum phosphorus also may be reduced during the attack, and was low in seven of our patients. Patients with TPP may be confused with GB syndrome, renal tubular acidosis and IHPP. In our study, one patient was inadvertently diagnosed as GB syndrome and was treated with IVIg by the primary physician and another with acetazolamide for prophylaxis of suspected IHPP. Acetazolamide aggravates muscle weakness in patients with TPP. The comparison of TPP and IHPP in a study revealed that patients with IHPP presenting before the age of 20 years may have a family history and that serum potassium levels are not very low. Severe hypokalemia in periodic paralysis suggests an underlying secondary cause. In our study, the demographic and clinical features were not significantly different in both the groups, except serum potassium, which was lower in the TPP group compared with the IHPP group. The thyrotoxic symptoms may be absent at the time of attack of TPP in 10-25% of the patients. , In our study, two-thirds of the patients with TPP had subclinical thyrotoxicosis/hyperthyroidism at the time of presentation. This makes diagnosis of TPP more challenging. A high index of suspicion is needed for the diagnosis of TPP, especially in a young to middle aged male of Asian ethnicity who develops hypokalemia and paralysis. Occurrence and severity of TPP does not depend on severity and etiology of thyrotoxicosis. In our study, the cause of thyrotoxicosis could be ascertained in seven patients, which were toxic nodular goiter, Grave's disease, diffuse toxic goiter, colloid goiter and thyroiditis. Etiology of hyperthyroidism could not be determined in two of our patients. Treatment of TPP is oral or intravenous potassium supplementation, depending on the severity of weakness and to prevent recurrence. Nonselective beta blockers and correction of thyrotoxicosis are recommended. Rebound hyperkalemia has been reported in TPP and sporadic HPP during treatment. Fatal cardiac arrhythmia has been reported secondary to rebound hyperkalemia in TPP. It is important to monitor the serum potassium during treatment to avoid such complications. In our study, three patients with TPP and eight with IHPP had rebound hyperkalemia. None of the patients however had complications of rebound hyperkalemia. In our patients, propranolol and neomarcazole were prescribed to all. Radioactive iodine or surgery was performed later depending on the severity of the thyrotoxicosis and patient preference. Correction of thyrotoxicosis is important for preventing the recurrent attacks of paralysis. The limitations of the present study are its retrospective nature, having been performed in a neurology setting and long-term follow-up not being available. It can be concluded from this study that TPP comprises about 17.3% of HPP. All the patients with HPP should be investigated for thyrotoxicosis because management of thyrotoxicosis prevents attacks of TPP. The authors acknowledge Mr. Rakesh Kumar Nigam for secretarial help. 1. Rosenfeld M. Acute aufsteigende lahmung bei morbus basedow. Klin Wochenschr (Berl) 1902;9:538-40. 2. McFadzean AJ, Yeung R. Periodic paralysis complicating thyrotoxicosis in Chinese. Br Med J 1967;1:451-5. 3. Okinaka S, Shizume K, Iino S, Watanabe A, Irie M, Noguchi A, et al. The association of periodic paralysis and hyperthyroidism in Japan. J Clin Endocrinol Metab 1957;17:1454-9. 4. Ober KP. Thyrotoxic periodic paralysis in the United States. Report of 7cases and review of the literature. Medicine (Baltimore) 1992;71:109-20. 5. Kelley DE, Gharib H, Kennedy FP, Duda RJ Jr, McManis PG. Thyrotoxic periodic paralysis. Report of 10 cases and review of electromyographic findings. Arch Intern Med 1989;149:2597-600. 6. Chan A, Shinde R, Chow CC, Cockram CS, Swaminathan R. In vivo and in vitro sodium pump activity in subjects with thyrotoxic periodic paralysis. BMJ 1991;303:1096-99. 7. Balakrishnan RK, Chandran SR, Thirumalnesan G, Doraisamy N. Thyrotoxic periodic paralysis. Indian J Endocrinol Metab 2011;15(Suppl 2):S147-9. 8. Mehrotra S, Arora A, Kar P, Anuradha S. A case of thyrotoxic hypokalemic paralysis. Malays J Med Sci 2004;11:90-91. 9. Aggarwal S, Nand N, Aggarwal HK. Thyrotoxic Periodic Paralysis. J Indian Acad Clin Med 2007;8:265-7. 10. Maurya PK, Kalita J, Misra UK. Spectrum of hypokalaemic periodic paralysis in a tertiary care centre in India. Postgrad Med J 2010;86:692-5. 11. Shizume K, Shishiba Y, Kuma K, Noguchi S, Tajiri J, Ito K, et al. Comparison of the incidence of association of periodic paralysis and hyperthyroidism in Japan in 1957 and 1991. Endocrinol Jpn 1992;39:315-8. 12. Ko GT, Chow CC, Yeung VT, Chan HH, Li JK, Cockram CS. Thyrotoxic periodic paralysis in a Chinese population. QJM 1996;89:463-8. 13. Biering H, Bauditz J, Pirlich M, Lochs H, Gerl H. Manifestation of thyrotoxic periodic paralysis in two patients with adrenal adenomas and hyperandrogenaemia. Horm Res 2003;59:301-4. 14. Saeian K, Heckerling PS. Thyrotoxic periodic paralysis in a Hispanic man. Arch Intern Med 1988;148:708. 15. Tinker TD, Vannatta JB. 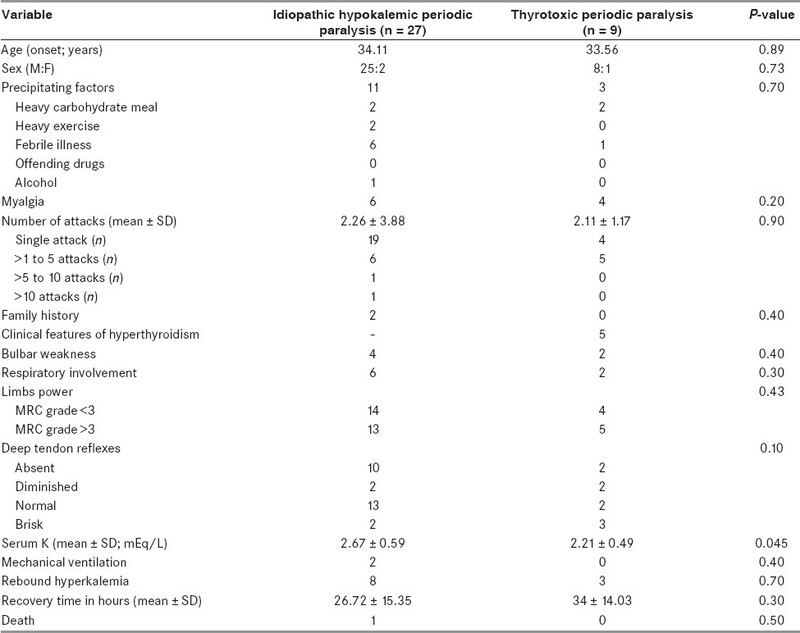 Thyrotoxic hypokalemic periodic paralysis: report of four cases and review of the literature. J Okla State Med Assoc 1987;80:11-15. 16. Charness ME. Clinical conferences at The Johns Hopkins Hospital. Hypokalemic periodic paralysis. Johns Hopkins Med J 1978;143:148-53. 17. Mathew B, Devasia AJ, Ayyar V, Thyagaraj V, Francis GA. Thyrotoxicosis presenting as acute bulbar palsy. J Assoc Physicians India 2011;59:386-7. 18. Bertola G, Ausenda C, Bocchia M, Grassi F, Ciani M, Sassi L. Bulbar paralysis and flaccid tetraparesis in thyrotoxicosis. Recenti Prog Med 2002;93:169-71. 19. Liu YC, Tsai WS, Chau T, Lin SH. Acute hypercapnic respiratory failure due to thyrotoxic periodic paralysis. Am J Med Sci 2004;327:264-7. 20. Kalita J, Nair PP, Kumar G, Misra UK. Renal tubular acidosis presenting as respiratory paralysis: Report of a case and review of literature. Neurol India 2010;58:106-8. 21. Manoukian MA, Foote JA, Crapo LM. 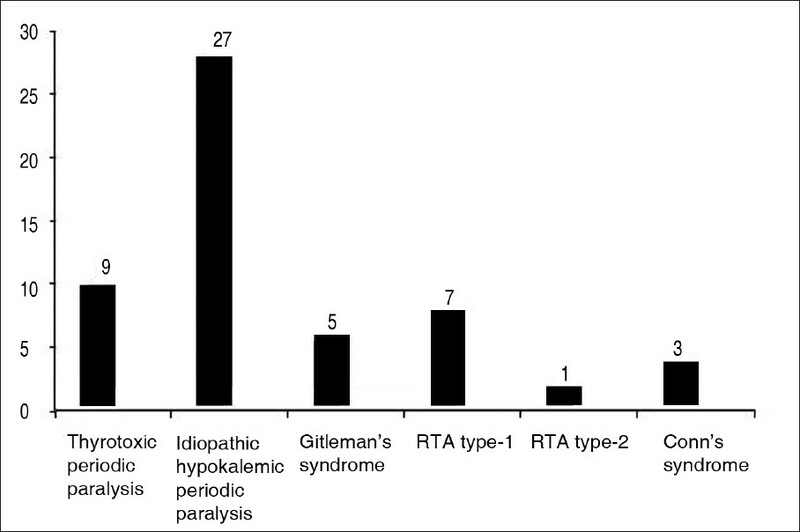 Clinical and metabolic features of thyrotoxic periodic paralysis in 24 episodes. Arch Intern Med 1999;159:601-6. 22. Kung AW. Clinical review: Thyrotoxic periodic paralysis: a diagnostic challenge. J Clin Endocrinol Metab 2006;91:2490-5. 23. Ahmed I, Chilimuri SS. Fatal dysrhythmia following potassium replacement for hypokalemic periodic paralysis. West J Emerg Med 2010;11:57-9. Ghosh, S., Sahoo, R., Rao, S., Rath, D.